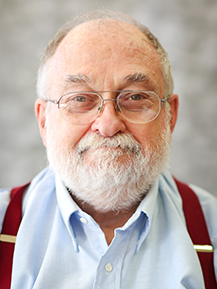 Prof. Blix, ’70, has been teaching at Wabash since 1996. (Previously he did a few warm-up stints at the College in the early 1990s). At one time or another, he’s taught most courses in the department. But he principally teaches world religions (focusing on Islam and on the religions of China and Japan), religion and culture, and methods and theories of interpreting texts (whether writings, or things like art and architecture). His current projects are evenly divided between a study of feeling and emotions in the Analects of Confucius, and problems in interpreting Laozi’s Dao De Jing. He’s traveled in Greece, Italy, India, China, and England, Scotland, and Wales. In 2005-06, he was a Carnegie Scholar at the Carnegie Institute for the Advancement of Teaching in Palo Alto, California. When not teaching or chatting with students in his office, Prof. Blix likes taking walks, singing in the Crawfordsville Community Chorus (second tenor), and playing the piano or Chapel organ. He is a film buff, and loves music of all kinds. He relishes good food shared with friends. He’s passionate about the poetry of Wordsworth and Li Bo. But on good days he also frequently finds himself wandering about Hogwarts or Middle Earth. Prof. Blix, ’70, has been teaching at Wabash since 1996. (Previously he did a few warm-up stints at the College in the early 1990s). At one time or another, he’s taught most courses in the department, but he principally teaches world religions.